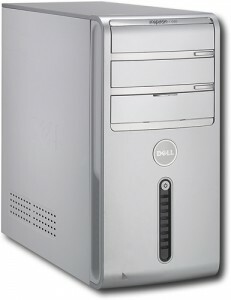 In recent years Dell has emerged as the king of the personal computer realm. Walk into any home or business and quite often you will see at least something made by Dell. However, having a popular brand and a large presence in the market, should not be the sole deciding factor when looking to purchase a new computer. Lets take a look at one of Dell’s newer home computing systems, the Inspiron E7400 and see if it lives up to the branding that Dell has garnered over the past few years. Coming in with a decent set of stats, the E7400 offers a package that is more than capable of day to day home computing. Activities such as web surfing, word processing, watching videos should not be a problem for this computer what so ever. The E7400 comes with a very capable optical drive, capable of burning CD’s and DVD’s right off the bat, with the included Roxio 10 burning software. Built into the front of the computer the E7400 comes with the increasingly common set of card readers that work with the majority of camera memory cards on the market. Light gaming should not be a problem as well, this would include basic windows games of course, as well as puzzle type games such as Jewel Quest. The graphics card however is a little on the lower end in terms of power, so I would recommend upgrading it if you want to play any more advanced 3D games, I am not saying they would not work, just that they would tax the computer’s resources. With a price point of approximately 650 dollars, the E7400 falls into the budget computing range. Now, being a budget PC is not necessarily a bad thing. Being a budget PC in the current market means what you trade for in a good price is most often longevity. The old mantra, you get what you pay for, comes to mind, and unfortunately is true when it comes to modern computers. While it can vary greatly from computer to computer, as well as how well you maintain it, but the bottom line is, a budget computer just does not have the staying power as some of its higher end counterparts. Grabbing an extended warranty however, can often help mitigate this and while adding a little on top of the price tag, can still often come in less expensive than a more expensive computer. The E7400 offers up decent stats, with a fairly decent price, however, for not too much more, there are other computers, such as HP’s Pavilion a6750y, which for less than a hundred dollars more offers much more in terms of computer power. Unless you really need to pinch pennies, find this on a sale or as part of a monitor/printer/computer deal, I would keep looking for a computer that gives you more bang for your buck. Even if you need to pinch pennies there are better budget brands such as eMachines that will offer similar staying power without paying for that Dell logo on the front.